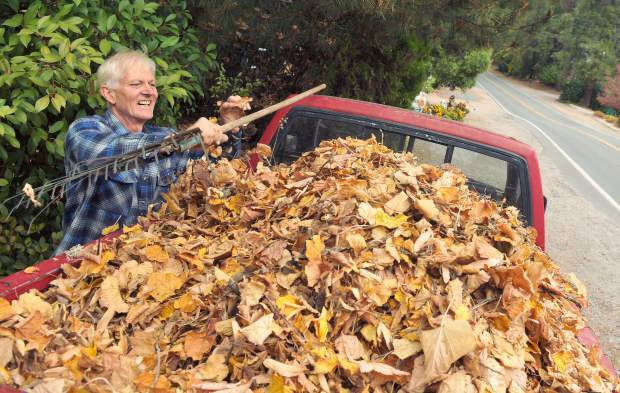 Nevada City's Leo Chapman finishes putting a load of garden leaves into the back of his pickup Thursday afternoon in advance of this weekend's storms. The pile of leaves was bound for his farm in the country where they were to be mixed into mulch. Nevada County residents are bracing for what weather forecasters are calling Northern California’s first significant rainfall. Light rain was scheduled begin to develop Thursday night and into the day Friday though the brunt of the rain will come later Friday. “As you head into the evening and into Friday night is when the rain will be the heaviest,” National Weather Service Meteorologist Cory Mueller said Thursday afternoon. Folks making the trip to Center High School in Antelope to cheer on the Bear River Bruins as they fight to make the playoffs (full story, page B8), will want to leave early to allow for traffic delays and dress for the elements. The wind gusts could reach 20 miles per hour Friday night and calls for a 41-degree low. Forecasters are anticipating between 1 to 2 inches of rain to fall between the two systems, the second of which is expected to move in Sunday and out of the region Monday. The rain will add to Grass Valley’s current rain total of 1.04 inches that fell on Oct. 20. The 2016-2017 rain year, which lasts between October 1 to September 31, brought nearly 100 inches of rain and caused issues all over the county, including the Little Wolf Creek sinkhole in Grass Valley and the Little Deer Creek sinkhole in Nevada City, Brunswick Road subsidence, and multiple mud slides and wash outs along Highway 49.